One of the best rentals on Keewaydin Lake. This quiet, fun, relaxing family getaway has 200 feet of sandy beach with a gradual entry ~ perfect for babies and small children. Great yard for the kids & dog to play. Swimming, boating, fishing and kayaking are ideal ways to spend time on the lake. The perfect place to unwind to the sounds of loon. Enjoy scenic views...big sky, green mountains and sparkling water. This two-bedroom/one-bath cottage is charmingly decorated throughout. A view of lake from almost every room. Featuring a dock, fire pit, outside furniture, large lawn, a regulation volleyball net, 2 kayaks and 2 rowboats. Cable TV, DVD & VCR player/movies available. 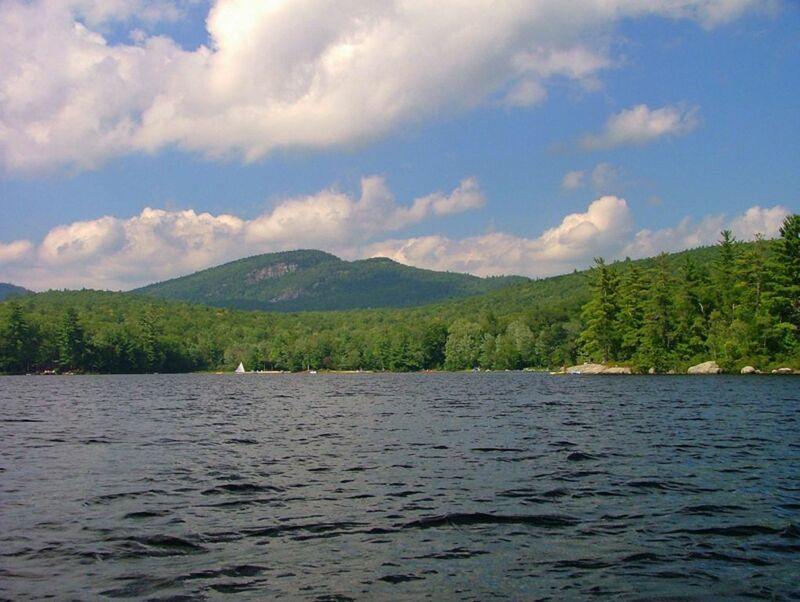 30 minute drive to quaint Bridgeton, ME and less than an hour away from North Conway, NH attractions. Well behaved dogs are always welcome!!! We had a great week at The Mad Moose! The beach was perfect for all of us and the gradual shallow slope into the lake was great for our young son and dog. Nice camp fires almost every night. The house was comfortable and campy. Hope to be back next year! We loved our week at the mad moose!! Our son had the time of his life with the gradual entry into the water. The cabin was the perfect size! It was clean and our host was so nice!! Today is the start of our second week back to work since staying at The Mad Moose, and I don't think any of us have stopped thinking about our vacation, or wishing we were still there! We had a truly amazing time the week of the Fourth of July. It was our first vacation together as two families becoming one, and we couldn't have asked for a better week. The cabin was a very pleasant surprise, as the pictures don't do it justice on size. There was plenty of room for the five of us, plus our Golden Retriever, Roman. The lake itself was stunning, very spacious, but also very quiet (3 boats total on the 4th). The fishing was AMAZING, and probably our overall favorite part, with a total for 43 Large Mouth Bass, and 1 Pickerel. Paula was very helpful, and easy to reach. She made this first time experience very comfortable. Roman, our 6yr old Golden, spent the entire week in the lake, and eventually out on the floating dock with the kids, after figuring out how to climb the ladder to join them. I think he slept the entire first week we were home! I will cherish the memories of this time with my furry best friend more than words can say. The local stores had kind of slim pickings for stocking up, but were convenient, and Hannaford was about 35min away. The only reason we gave a 4 out of 5, is due to the yard being very flooded/muddy. Although this is not a reflection on The Mad Moose or our stay, it is something to be aware of in rainy months. It also made it really hard to keep up on keeping the floors clean! Lots of sweeping :) Despite that small detail, we are all in agreement that we will be coming back to The Mad Moose, and look forward to it!! Thanks again, Paula, you and your camp have given us an amazing memory that we will not soon forget! Amanda, Dave, Tim, Libby, Katie, and Roman!! If you need a week to RELAX this is the place. Our family has two boys 10 and 11 plus our dog Elvis and we all had a great time. The cottage is clean and cute. It is exactly like it is described. The owner was helpful and organized. We kayaked, fished, walked, biked, swam and read books. The sunsets ended the day with breathtaking beauty. Don't forget to stargaze at night because you feel like you see to the next galaxy. I would recommend this to a friend. Our young family of 5 (two small children and 1 dog) stayed at the Mad Moose August 2010 for one truly enjoyable week. The cabin is nicley laid out (with living area at one end and the children's bedroom at the opposite end), a clean kitchen and bathroom - with a bathtub! But the best part is the wide sandy beach and shallow entry into the water. Our 3 year old was in heaven as he played with his "diggers" and waded in the knee high surf. I highly recommend this property for young families. It is close enough to the attractions in North Conway (45 min) and Storyland (1 hour), but remote enough to feel like you are really getting away from it all. My wife, five children and I spent a wonderful week at the Mad Moose in mid July 2009. Nothing but fun and sun...and the fish... The fishing is just second to none. Everyone caught fish from my 3 year old on up...With the record 8+ lbs bass that I caught topping off the week. We had a wonderful vacation with tons of great memories including my 5 year old son learning to snorkel for the first time. Thanks so much for the Mad Moose!